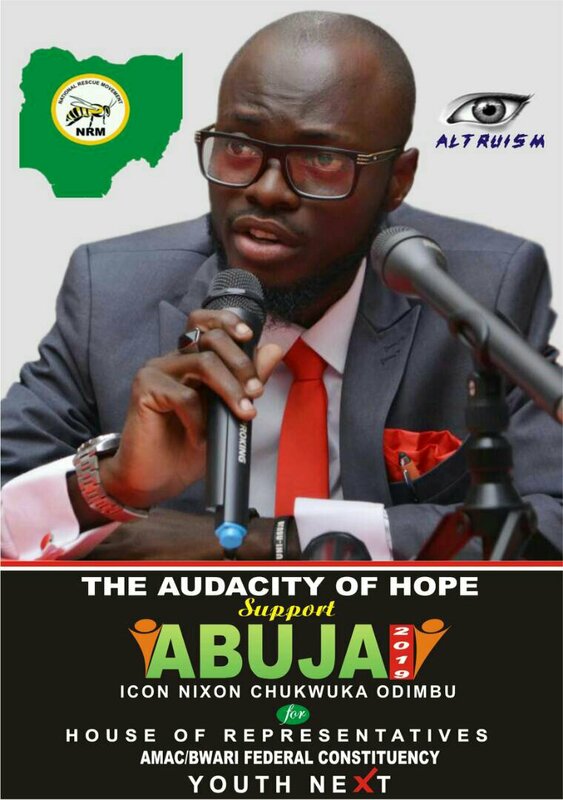 A Nigerian youth Activist, former DSUG president University Of Abuja and Chairman National Rescue Movement, Party (NRM) FCT Chapter, Icon Nixon Chukwuka Odimbu on Monday joined the list of contenders for election into the House Of Representatives in Abuja. Although he had chosen to run under the credible and resplendent political platform, NATIONAL RESCUE MOVEMENT PARTY (NRM), he has vowed to slug it out in the 2019 general elections for Amac/Bwari Federal Constituency. Nixon from Ezi In Aniocha North Local Government Area Of Delta State and President and Founder of the Most wanted Activism Group, #THE LIMIT BREAKERS WORLDWIDE (TLBW) revealed his ambition in an interview with journalists in Abuja. According to him, it is inspiring that amidst difficulties and growing anxiety over the future of the country, Nigerians have refused to succumb to despair and hopelessness. He said: “It is therefore gratifying that my vision and service – driven life that I, after due consultations with family, the private and public sectors, civil society groups, labour unions, religious and political leaders, youths and students groups, hereby offer myself and my services to the great constituents of Abuja North as a candidate for the House Of Representatives Amac/Bwari Federal Constituency. I declare this intention solemnly with an acute awareness of the onerous challenges that lay ahead and powered by our dogged commitment to survive and weather the storm as they may come in acknowledgement that no true path towards growth and development is with an admixture of thorns and roses. ” My story is similar to that of so many underprivileged Nigerians of my generation – Born and wrapped with the shawls of penury and despair and aware of the crushing realities of my station darting at my sight, I ploughed through childhood with my dreams and aspirations for comfort, defied the stratification of class to join my voices with the few straining against injustices. I have never since looked back nor compromised on the ideals and principles that have shaped my interaction with my immediate and remote world. And I am happy about it. Nixon said although the task before the youth is daunting, the youths have manifold possibilities to liberate Nigerian and put the economy on the global map. He said: we are the threshold of immense opportunity one as slippery as the sum of dreams, hopes and aspirations that have gone down the steep decline of neglect and disbelief. So on more. The time has never been more right for youths to rise to the responsibility of leadership, taking off the cloak of passive participation with mind and effort in the creative process for a better future with hope and confidence. “It is for the reason that 2019 election is about the youths, it is about ensuring that we emancipate ourselves from the political stereotypes and becoming more socially and politically responsible to the country. I worry today that most of our youths who, given the opportunity, would have ameliorated the sad state of this nation, too often had their aspirations stilted by an avalanche of opposition bred in the very society we live in. Within the borderlands of Abuja the glaring mismatch between our potentials and our achievements has become for many a frustrating puzzle; for others it is a topic for debate; and yet for another group, it is doomsday lament. But with strength of conviction and positivity which enamels our sense of patriotism towards Nigeria and our great people. I consider it a golden opportunity and a bittersweet chance to manifest our effrontery, activate our innovative instinct, showcase our character and turn our dreams to reality. “Myraids of groups and platform in different nomenclatures have bracingly and clandestinely constituted themselves into principalities of ready foot soldiers to serve the ignoble interest of serially recycled politicians within the polity keen on stemming the rise of a youth – driven politica movement and awakening to challenge the lethargy of political status quo. “I want to do my part in rebuilding a country too long fettered by fears, suspicion of each other and official corruption. A new Nigeria where hardwork and dedication is rewarded, where the people constitute the greatest investment because the true wealth of a nation lies with the people.